Interventional Radiology (IR) is one of the most technologically advanced imaging specialties of medicine that has pioneered some of medicine’s greatest advancements including angioplasty and stenting. In the past year interventional radiology has exponentially grown with minimally invasive image-guided techniques. Interventional radiology is a highly specialized branch of radiology where procedures are performed in an OR type room (Angio Suite) equipped with two C-Arms (Biplane) for visualization of the vessels (Angiography). What’s the difference between surgery and IR procedures? IR procedures are performed making a small keyhole incision in the femoral artery instead of opening up the patient and performing traditional surgery. This nonsurgical technique reduces the risk of infection and bleeding out, which allows the patient to recover faster and go home sooner. Wires and catheters are placed through the tiny keyhole to visualize and remodel/fix the vessel. Through skilled manipulation of wires, catheters and X-ray fluoroscopy the interventional radiologist is able to navigate all over the body. From the femoral artery patients can have their brain worked on (aneurysm stent or coiled) or the very tip of their toe revascularized due to disease. Most commonly these procedures treat vascular diseases and or other abnormalities such as: Aneurysms, P.E.’s, DVT’s, AVM’s, fistulas and tumors. Technologist roles and responsibilities include practicing aseptic techniques while setting sterile trays and scrubbing in to assist the physician. IR technologist are very knowledgeable of the procedures performed, anatomy visualized and products needed. Equipment and Supplies include: C-arms, IVUS (Intravascular Ultrasound), Ultrasound, Dyna CT/ 3D’s, Injector, contrast, wires, catheters, sheaths, sterile drapes, gowns and gloves. Here is a great video from the Interventional Initiative! Without A Scalpel from the Interventional Initiative on Vimeo. 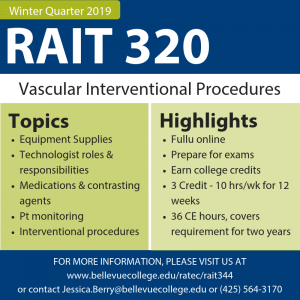 Bellevue College offers a fully online Vascular Interventional instrumentation and procedures course designed to prepare students for the Vascular Interventional ARRT exams! Coupled with the optional clinical practicum, students can fully master the post primary modality and go into the ARRT exams with confidence! RAIT 320 is intended to meet the degree requirements of the Bachelors of Applied Science, Technology concentration as well as the requirements of the Vascular Interventional Advanced Certificate of the Radiation & Imaging Sciences program. If you are interested, check out more about our Interventional Procedures class coming up this winter!